Background: Available data suggest two seemingly opposite trends with regard to the natural history of migraine. Migraine prevalence decreases with age. In some individuals, migraine progresses to chronic daily headache. Objective: To contrast the clinical features of migraine across the life span. Methods: A validated computer-assisted telephone interview (CATI) was used to identify a population sample in three urban centers in the United States. Eligible participants were older than 18 years. The CATI covered the International Classification of Headache Disorders criteria for migraine and probable migraine (PM). Prevalence and clinical features of migraine and PM were examined by age. Results: This sample consists of 145,335 participants. The overall prevalence of migraine was 15%, whereas the overall prevalence of PM was 14.6%. Migraine prevalence was highest between ages 30 and 39 years. In older ages, PM was more prevalent than migraine. Among those with migraine, the prevalence of unilateral and throbbing pain peaked at intermediate ages and declined after that. The prevalence of photophobia and phonophobia related to the attacks declined with ages, whereas the prevalence of aura increased. The proportion of those with 10 to 14 headache days per month also increased, from 12.5% in those ages 18 to 29 to 41.0% (odds ratio = 4.8, 95% CI = 3.9 to 7.1) in those older than 70. Conclusion: The profile of migraine changes over the life span and suggests three nonexclusive profiles. In many, migraine remits. In some patients with migraine, attacks get less typical, resembling probable migraine instead of full migraine. In some, migraine progresses. Reconciling the evidence, it may be suggested that some migraineurs remit with age, whereas others progress to CDH. Finally, some would present less typical attacks over time, filling the criteria for probable migraine (PM) instead of migraine. Therefore, we conducted a large cross-sectional population study to assess the prevalence and clinical features of migraine across the life span. We first hypothesized that the ratio of migraine to PM decreases after certain ages, reflecting the fact that migraine becomes less marked over the life span. We also wanted to investigate if in those with full migraine, the headache attacks become less typical with age. Finally, we hypothesized that if migraine progresses in certain individuals, although less typical, the headache attacks should become more frequent in those who did not remit. A computer-assisted telephone interview (CATI) was conducted in the Atlanta, Baltimore, and Philadelphia metropolitan U.S. areas to identify individuals with selected health problems, including primary headache disorders. Households were selected using random digit dialing methods. Ten attempts were made to contact each household. At the time of initial telephone contact, a census of the household was obtained from the person who answered the phone. At this time, the gender and age of each eligible household member were ascertained. Age-eligible individuals (≥18 years) were selected for the interview. Verbal informed consent (institutional review board approved) was obtained, and the purpose of the survey was described to the respondent. Respondents who agreed to participate were interviewed by trained interviewers using the CATI and computer scripts. The validity of the CATI for the diagnosis of migraine was previously assessed by comparing the telephone-based diagnosis for migraine with an independent diagnosis assigned by a headache specialist.10,11 Both in the United States and in the United Kingdom, the sensitivity of the telephone interview diagnosis of migraine was around 91%, whereas the specificity was around 97%, and the positive predictive value was close to 94%. The CATI headache interview has been described in detail elsewhere.11,12 In brief, participants were first asked if they had at least one headache not due to a head injury, hangover, pregnancy, or an illness such as a cold or flu. They were subsequently asked if they had at least 5 headache days in the previous year. For those who responded positively, they were then asked about how many different types of headache they had. Detailed questions were first asked about the most severe headache type that the respondent had in the last 12 months. The most severe headache type was initially self-defined. If respondents had a second and different self-defined headache, the same questions were also asked about this headache. Questions covered all the diagnostic features of typical migraine with and without aura, as specified by the first edition of the International Classification of Headache Disorders (ICHD-1).13 The criteria remained unchanged in the second edition of the ICHD (ICHD-2, 2004).14 We used the ICHD-2 criteria to assign a PM diagnosis. According to the ICHD criteria, subjects with 15 or more headache days per month were not included in the migraine or PM groups. The report of a headache pain feature (i.e., throbbing) was followed by a question about how often the feature occurred with the specific headache type. The response options included never, rarely, less than half the time, and half the time or more. According to previous studies, never and rarely were considered negative responses.13,14 For nausea, photophobia, and phonophobia, follow-up questions addressed the severity (mild, moderate, or severe) of the symptom. In addition to the headache features, headache frequency was assessed over the last month (1-month period) and annualized. The survey also assessed demographic information (age, gender, race, educational level, marital status) and health status (history of several other medical conditions). Headache severity and headache-related disability were assessed in a 10-point scale. Analyses were performed using SPSS. Data were summarized using frequency counts and descriptive statistics. We used bivariate correlations procedures to compute Pearson correlation coefficient, Spearman ρ, and Kendall τb with their significance levels. For comparisons, we present the data in the form of odds ratio (OR) with the respective 95% CI. Our sample consists of 145,335 subjects with complete CATI health survey interviews (table 1). In brief, respondents were predominantly women (66.3%) and Caucasian (67.3%). Age ranged from 18 to 99 years. Whereas 75.3% were from 18 to 49 years old, 12,638 (8.6%) were older than 60 years, and 2,653 (1.8%) were older than 70. Overall, the prevalence of migraine was 15%, whereas the prevalence of PM was 14.6%. Pooling migraine and PM together, the prevalence of all migraine (AM) was 29.6%. The peak of prevalence for migraine happened from 30 to 39 years (prevalence of 20.1%). The prevalence of migraine declined subsequently in every age range, to a minimum of 3.9% in those older than 70 years (table 2). For PM, the peak of prevalence happened at younger ages (18 to 29 years, 17.5%) and also declined subsequently to a prevalence of 6.4% at the age of 70 or more. Across the life span, migraine was more common than PM from ages 30 to 49. 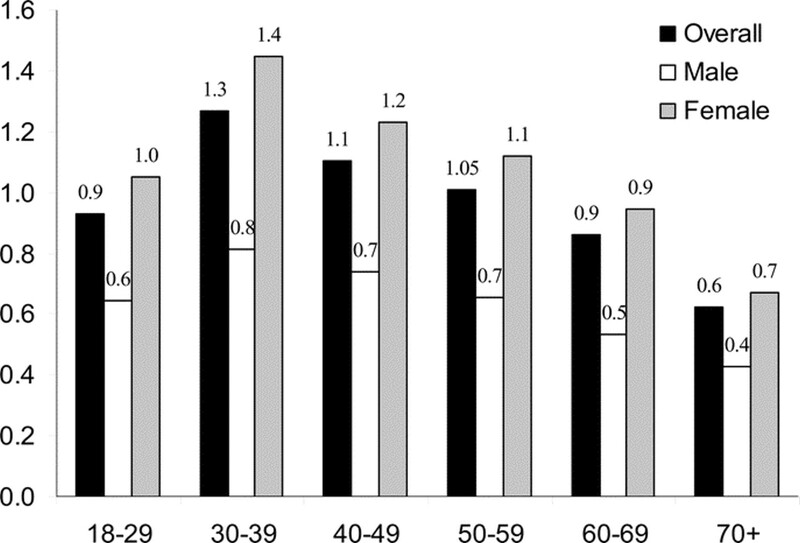 The proportion of subjects with migraine and PM was nearly the same in those from ages 50 to 59, and PM was more common than migraine in the younger and older ages. Figure 1 displays the ratio of migraine to PM overall and by gender. Overall, the ratio was higher than 1 (indicating that migraine was more prevalent than PM) in those from ages 30 to 59. The ratio was lower than 1 (PM was more common than migraine) in those younger than 30 and 60 or older. Although PM tended to be more common than migraine in men and the opposite was seen in women except at older ages, the patterns were similar in both genders. Figure 1. Ratio of migraine to probable migraine within the all-migraine group. Clinical features of migraine by age. We assessed the proportion of individuals with the distinguishing migraine features (the criteria proposed by the ICHD as the migraine diagnostic features) by age range. In regard to the pain features, the proportion of subjects reporting that most of their attacks were throbbing declined in every age range from those 18 through 29 to those older than 70 (65.7%). With use of the age of 18 to 29 as a reference, although 83% of this group had throbbing pain, 79.1% of those from ages 40 to 49 (OR = 0.61, 95% CI = 0.51 to 0.73), 75% of those from ages 60 to 69 (OR = 0.59, 95% CI = 0.49 to 0.7), and just 65% of those age 70 or older (OR = 0.37, 95% CI = 0.25 to 0.86) had it (table 3). Although throbbing pain was more common in those from ages 18 to 29 and declined subsequently for every other age range, for other pain features the pattern was slightly different, being more common at intermediate ages than at both extremes. The ORs and their 95% CIs are shown in table 3. In brief, whereas severe pain was reported by 78% of those from ages 18 to 29, it was reported by 81% of those ages 30 to 39 (OR = 1.24, 95% CI = 1.13 to 1.35), 82.2% of those ages 40 to 49 (1.28, 1.16 to 1.4), and then declined to a lowest of 63% in those age 70 or older (0.47, 0.31 to 0.7). Being worsened by physical activities happened in 58% of those ages 18 to 29, 60.5% of those ages 30 to 39 (1.11, 1.03 to 1.2), 59.1% of those ages 40 to 49 (nonsignificant), and then declined for just 36% of those age 70 or older (0.41, 0.27 to 0.6). Finally, for unilateral pain, 60% of ages 18 to 29 had it compared with 67% in those ages 50 to 59 (1.35, 1.22 to 1.44) and 53% in age 70 or older (0.7, 0.5 to 0.9). For the associated symptoms, no clear trend for nausea in regard to age was observed (table 4). The proportion of subjects reporting phonophobia in most attacks, however, clearly diminished with age. Whereas 77% of those ages 18 to 29 and 30 to 39 had it, just 67% of those ages 60 to 69 (0.6, 0.5 to 0.8) and 68% of those age 70 or older (0.6, 0.4 to 0.9) had it. For photophobia, there was also a significant inverse trend in regard to age, although less pronounced than for phonophobia and not significant. Finally, as expected, the proportion of subjects with aura increased by every single age range, from a low of 13.2% from ages 18 to 29, to 15.2% in those ages 30 to 39 (1.37, 1.23 to 1.52), 20.1% in those ages 40 to 49 (1.7, 1.5 to 1.8), 25.2% in those ages 50 to 59 (2.2, 2 to 2.5), 31.6% in those ages 60 to 69 (3.1, 2.5 to 3.6), and a high of 41% in those age 70 or older (4.6, 3.1 to 6.8). We assessed the proportion of migraineurs who had from 10 to 14 headache days per month (not necessarily migraine days) as a function of age and found a direct relationship (figure 2). Whereas 12.5% of those ages 18 to 29 had 10 to 14 days of headache per month, the proportion was significantly higher in every other age range, peaking in those age 70 or older (41%, OR = 4.8, 95% CI = 3.9 to 7.12). Figure 2. Proportion of subjects with 10 to 14 headache days per month within the all-migraine group, according to the age group. Clinical features in the full spectrum of migraine (AM). Pooling migraine and PM together in the AM group, similar patterns of what was observed for migraine were seen. Throbbing pain declined steadily with age. For the other headache features, there was an increase in the proportion of the features in the intermediate ages vs ages and elderly. For example, for unilateral pain, whereas 53% of those with AM ages 18 to 29 had it, 60% of those ages 50 to 59 reported it vs 48% in those older than 70. Similarly, severe pain was reported by 50% of those ages 18 to 29, 54% and 52% in the subsequent age ranges, and 24% in those age 70 or older. Figure E-1 on the Neurology Web site (www.neurology.org) displays the proportion of individuals with AM with associated symptoms. As shown, the only migraine feature that consistently became more frequent with age was aura (happening in 7% of the AM patients from ages 18 to 29 and in 23% of those age 70 or older). Much less is known about the evolving clinical profile of migraine over the life span. This is important for a better comprehension on the natural history of migraine as well as for a more sophisticated clinical characterization of this disorder. It is also important to address the issue of migraine as a progressive or remitting disease or both. Our data can be summarized as follows: 1) The prevalence of both migraine and PM decrease with age past age 40, suggesting remission in a fraction of migraineurs. More subjects have migraine than PM at intermediate ages, whereas the opposite is true for the extremes of ages assessed in this study. This also suggests that migraine is less typical in the extremes of ages and flourishes from ages 30 to 49. 2) In those with ICHD-2 migraine, attacks tend to be more typical in the younger subjects than in the elderly. A higher proportion of young individuals have the hallmarks of migraine, such as unilateral pain, pain aggravated by exercise, and photo- and phonophobia. As expected, aura shows the opposite pattern and is more common with age. 3) The proportion of subjects with frequent headache days (10 to 14 days of headache per month) increased with age in both the migraine and the PM group. The phenotype of migraine according to the life span is poorly studied. A prospective study of our group also found that, in individuals older than 70, PMs with and without aura were more common than, respectively, migraine with and without aura. Most of those who filled criteria for PM when enrolled in the study had full migraine in the past.15 Furthermore, many who did not experience any migraine attacks in the year before the study had experienced migraine attacks in the past, with clinical improvement after the age of 60.15 A second study retrospectively assessed subjects seen in an outpatient headache service. Migraine happened in 25% of the elderly and 29% of younger migraineurs (nonsignificant).8 A lower proportion of migraine attacks in the elderly were unilateral (38 vs 57%, p < 0.01) or with associated symptoms (nausea = 75 vs 86%, p < 0.05; vomiting = 30 vs 54%, p < 0.05; photophobia and phonophobia = 83 vs 94%, p < 0.05). Some premonitory or other accompanying symptoms, such as paleness, dry mouth, and anorexia (not assessed in our study), were more common in the elderly. Based on this retrospective review, the authors concluded that migraine attacks are less typical in elderly individuals. Finally, the increase in the frequency of aura with age may be a late-life migraine accompaniment. If aura is generated by cortical spreading depression and migraine pain by neurovascular inflammation, these findings suggest that the mechanisms of cortical spreading depression remain intact, while the propensity to neurovascular inflammation declines. This pattern may arise as a result of age-related changes in the blood vessels or at the more central pathways that mediate pain. Our study has several strengths. The sample size is large, and subanalyses were therefore well powered. Data were collected using standard questionnaires, using a CATI that has been validated in the United States and the United Kingdom.10,11 Data were collected uniformly. Additional material related to this article can be found on the Neurology Web site. Go to www.neurology.org and scroll down the Table of Contents for the July 25 issue to find the title link for this article. Received September 19, 2005. Accepted in final form March 29, 2006. Lipton RB, Stewart WF, Diamond S, Diamond ML, Reed M. Prevalence and burden of migraine in the United States: data from the American Migraine Study II. Headache 2001;41:646–657. Rasmussen BK, Jensen R, Schroll M, Olesen J. Epidemiology of headache in a general population—a prevalence study. J Clin Epidemiol 1991;44:1147–1157. Scher AI, Stewart WF, Ricci JA, Lipton RB. Factors associated with the onset and remission of chronic daily headache in a population-based study. Pain 2003;106:81–89. Katsarava Z, Schneeweiss S, Kurth T, et al. Incidence and predictors for chronicity of headache in patients with episodic migraine. Neurology 2004;62:788–790. Cook NR, Evans DA, Funkenstein HH, et al. Correlates of headache in a population-based cohort of elderly. Arch Neurol 1989;46:1338–1344. Stang PE, Carson AP, Rose KM, et al. Headache, cerebrovascular symptoms, and stroke: the Atherosclerosis Risk in Communities Study. Neurology 2005;64:1573–1577. Mazzotta G, Gallai V, Alberti A, et al. 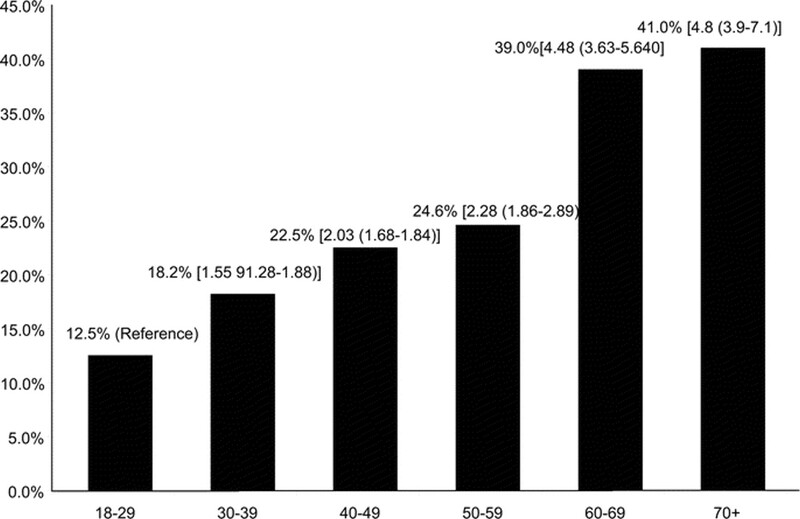 Characteristics of migraine in out-patient population over 60 years of age. Cephalalgia 2003;23:953–960. Martins KM, Bordini CA, Bigal ME, Speciali JG. Migraine in the elderly. Headache 2006;46:312–316. Bigal ME, Sheftell FD, Tepper SJ, Rapoport AM, Lipton RB. Migraine days decline with duration of illness in adolescents with transformed migraine. Cephalalgia 2005;25:482–487. Stewart WF, Lipton RB, Whyte J, et al. A multi-national study to assess reliability of the Migraine Disability Assessment (MIDAS) Score. Neurology 1999;53:988–994. Stewart WF, Lipton RB, Liberman J. Variation in migraine prevalence by race. Neurology 1996;47:52–59. Lipton RB, Scher AI, Kolodner K, Liberman J, Steiner TJ, Stewart WF. Migraine in the United States: epidemiology and patterns of health care use. Neurology 2002;58:885–894. Headache Classification Committee of the International Headache Society. Classification and diagnostic criteria for headache disorders, cranial neuralgias, and facial pain. Cephalalgia 1988;8(suppl 7):1–96. Headache Classification Committee of the International Headache Society. The International Classification of Headache Disorders. Cephalalgia 2004;24:1–160. Feleppa M, Bigal ME, Katz M, Lipton RB. Headache in the elderly. Headache 2005;45:841. Castillo J, Muñoz P, Guitera V, Pascual J. Epidemiology of chronic daily headache in the general population. Headache 1999;38:497–506. Patel NV, Bigal ME, Kolodner KB, Leotta C, Lafata JE, Lipton RB. Prevalence and impact of migraine and probable migraine in a health plan. Neurology 2004;63:1432–1438. Bigal ME, Kolodner K, Lafatta J, Leotta C, Lipton RB. Patterns of medical diagnosis and treatment of migraine and probable migraine in a health plan. Cephalalgia 2006; Jan 26:43–49.